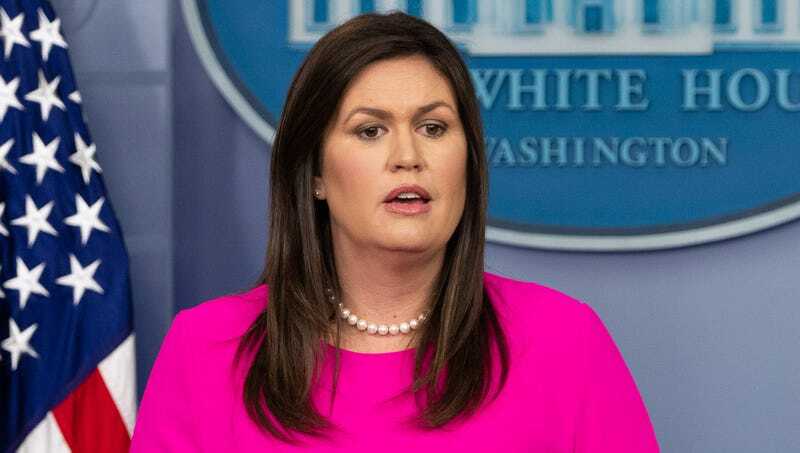 WASHINGTON—Explaining that the release of the secretly recorded conversation between Donald Trump and Michael Cohen could not have come at a better time, Sarah Huckabee Sanders stated Wednesday that playing the tape backward reveals a hidden message exonerating Trump from any misconduct. “I can confirm that if you play these recordings backward and at half speed, you can clearly hear the voice of Barack Obama saying, ‘We should frame Donald Trump so people think it was him, not me, who had all those extramarital affairs,’ and then Cohen saying, ‘You’re my best client, Barack,’” said the White House press secretary, adding that if you turn the treble all the way up and listen closely around the tape’s six-minute mark, you can make out former Democratic National Committee chair Debbie Wasserman Schultz instructing staffers to steal hacked email servers. “President Trump is actually quite grateful for the release of this tape, as it provides conclusive proof that investigations into his financial transactions and personal life are merely witch hunts meant to distract Americans from the real issues. Try it at home and hear the truth for yourself.” Huckabee Sanders went on to add that, later in the tape, one hears the voices of both Bill and Hillary Clinton confessing to the murder of Vince Foster.